You wouldn’t believe what happened. 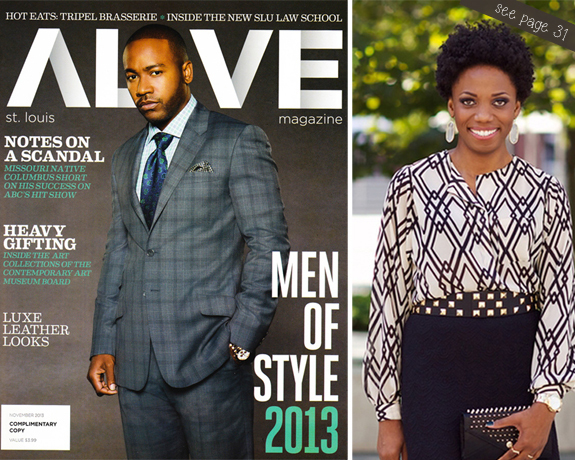 Economy of Style is featured in the November 2013 issue of Alive Magazine, the premier lifestyle magazine in St. Louis. I appear in “Blog Stars“, an article written by Sarah Stallman, introducing all of the winners of the inaugural St. Louis Fashion Blog Awards (STLFBA). Thanks so much again for voting me Best Budget Blog. That win earned me a feature spot in the article. I really appreciate your support! I, along with five other featured bloggers, had the privilege of being photographed by Attilio D’Agostino for the story. Attilio chose a street style theme for the shoot, so we hit the streets of downtown St. Louis in search of perfect locations for each of our images. Here are a few photos I captured with my iPhone during the shoot. Special thanks to fellow bloggers and 2013 best fashion blog award winners, Emily and Danica of Fox and Gypsy, for taking my picture during the shoot. If you’re in the St. Louis area, pick up a print copy of the magazine to read about all of the STLFBA winners and the cover story, of course, featuring Columbus Short from ABC’s hit show-Scandal. Not in St. Louis? Access the digital issue of the magazine here. Thanks! I loved the top so much that I bought it slightly larger because my size wasn't available. I just realized that Century 21 (where I got it) has a fully functional online store with more sizes that usually available in the actual stores. Congrats, Psyche! I loved the feature! You all looked so lovely! Aww thanks, Cassie! Congrats again on your award!